Colorados community health centers serve one-third of Colorados neediest patients through 17 health systems around the state, providing essential primary care in 57 of Colorados 64 counties. On Tuesday, the groups association, the Colorado Community Health Network, handed out their 2013 Community Health Champion awards. Solutions was honored for covering underserved people and putting a human face on health care. Katie Kerwin McCrimmon, a writer for www.HealthPolicySolutions.org, won the media award. (McCrimmons) in-depth reporting illuminates issues that often receive only limited coverage in other news media. Her writing is thoughtful and informative, said Donald Moore, CEO of the Pueblo Community Health Center, who presented the awards at the Warwick Denver Hotel. 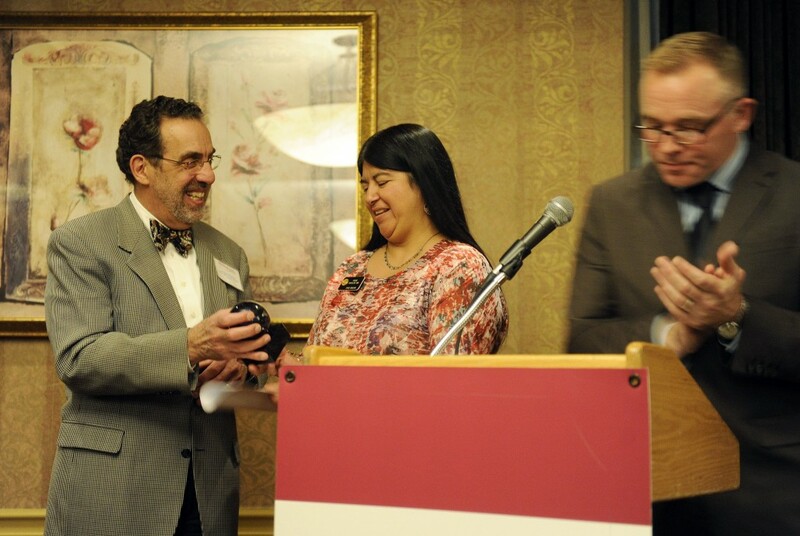 Dr. Paul Melinkovich of Denver Health presents an award to Sen. Irene Aguilar. Donald Moore, CEO of the Pueblo Community Health Center, is at right. Also honored were Sen. Irene Aguilar for her legislative work and Dr. Neal Jepson for his volunteer specialty eye care at Peak Vista Community Health Centers in Colorado Springs. Aguilar is also a primary care physician who worked for 21 years at Denver Health, one of the community health centers. Aguilars colleagues praised her for translating her concern for underserved patients into public policy. She plans to sponsor the bill that would expand Medicaid under the Affordable Care Act in Colorado and Aguilar is introducing a bill this week seeking universal health care in Colorado. She constantly draws on experiences to inform her positions and talks about her experiences when speaking on committees and on the floor, Moore said. Many of the community health centers rely on volunteer specialists in their communities to provide invaluable care to their patients. Dr. Jepson is an ophthalmologist who volunteers every other week to care for patients at Peak Vista. He specializes in retinal disease and intraocular lenses and is known for staying at the clinic until he sees every needy patient including last-minute add-ons. Jepson described caring for patients who have put off care for years. He described one 65-year-old man with diabetes who had been having vision problems for at least five years before seeing him. Jepson asked the man why he didnt come soon. The Spanish-speaking patient had a simple answer: Denaro. He doesnt need it, Jepson told the mans son. Thats why were here. Jepson said hes been blessed to live in a society that rewards physicians well. Its only right that we give back, he said. Dr. Neal Jepson, an ophthalmologist, regularly volunteers to care for patients who need specialty care at Peak Vista Community Health Centers in Colorado Springs. Altogether the community health centers provide care for one in t10 patients in the state. With Medicaid expansion likely to move forward in Colorado, the 17 health systems located from Dove Creek to Fort Lupton and from Sheridan to Basalt, are braced for an influx of new, needy patients. Community health centers already care for 71 percent of the states estimated 160,000 individuals who will move into Medicaid in 2014, Moore said. Yet (our) funding comprises less than 3 percent of the Department of Health Care Policy and Financings annual budget. Moore said the states getting a good bang for its buck. Community health centers are nationally recognized for providing quality care while delivering system-wide cost savings.